The world's most decorated Olympic swimmer completed 100m in open ocean off South Africa in 38.1 seconds to the shark's 36.1. Discovery Channel aired the "race". 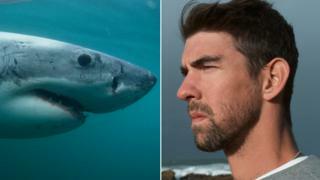 Before Sunday's broadcast, Discovery had the 28-time Olympic medallist, who is now retired, and the shark swim the course separately. Some social media users loved the "race" idea, but many said that they felt "robbed" by the simulation. Phelps himself tweeted that he was ready for a "rematch"... but in warmer waters. Bryan Habana, one of the fastest players in international rugby, decided to take on the world's fastest land animal in 2007 as part of an event sponsored by a conservation group. Habana is quick, but not Usain Bolt quick - running the 100m in 10.4 seconds at his best (compared with Bolt's 9.58 world record). Given the animals' clear advantage, the Italian only had to swim one length of the pool, while they had to swim two. But that didn't make a difference and the man nicknamed "Superpippo" was pipped at the post. He said later that he fell "a bit in love" with Leah, one of the dolphins. He is said to have had the starting gun go off close to the horse, stunning it and allowing him to take a strong lead (he also had a head start). Though this strategy worked most of the time, he didn't always win. But in that initial race, a fence separated the pair and it was obvious the animal wasn't giving it her best. In a second race, this time inside the ostrich's enclosure, Dennis was soundly beaten, as the ostrich leapt away and he was left chasing it through the dust.